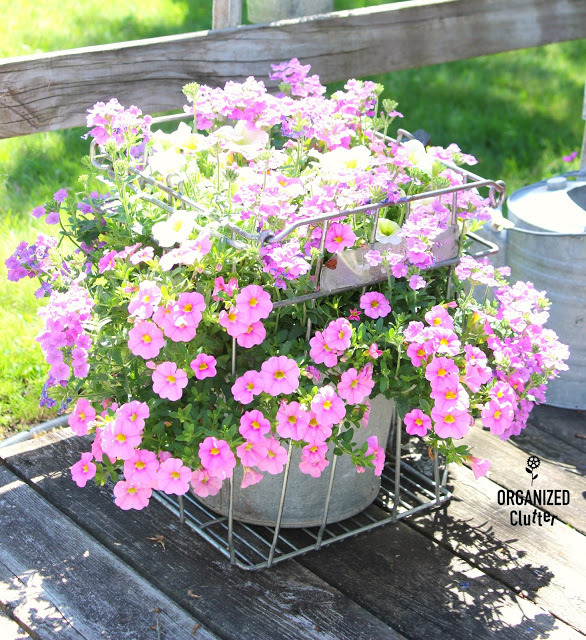 Many years ago now, I started re-potting all my purchased hanging baskets into galvanized buckets. I drill holes in the bottom of the buckets for drainage. There are advantages to planting in the buckets versus leaving them in plastic hanging baskets. 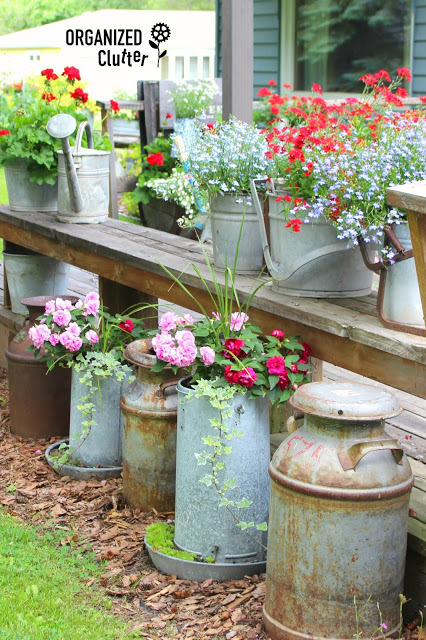 First and foremost, I love the look, plastic has no place in a Junk Garden. Also, the pails do not dry out as quickly as the plastic baskets. The following is a collection of 29 photos taken over the years of flowers in buckets and pails! 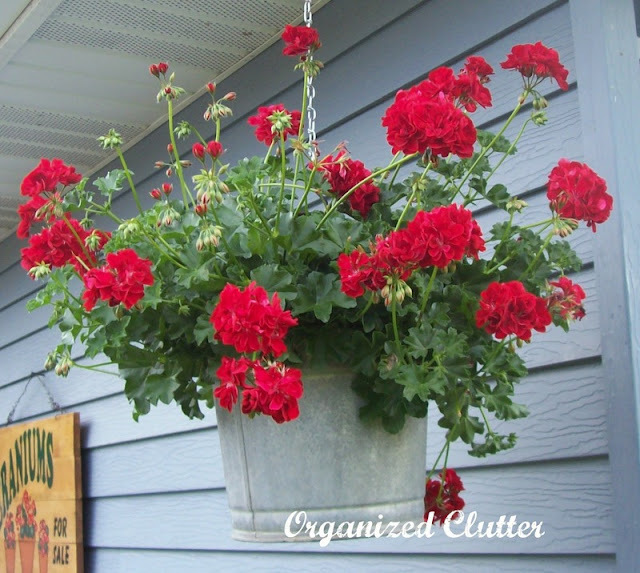 Red geraniums are just awesome in anything, but perfect in galvanized pails. This is a stenciled minnow bucket. A tutorial is here. Swingtime Fuchsias and Golden Jenny thrive in buckets, leaving very little metal showing! Annuals in buckets along a garden path at my sister in law Kris's garden. The polka dot plant has beautiful pink foliage. Pails in the garden at the far right at my friend Danita's house. One pail on the ground, and one getting more vertical interest on a wooden stool. On my deck, a bucket inside an egg crate with Calibrachoa poking through the wires. 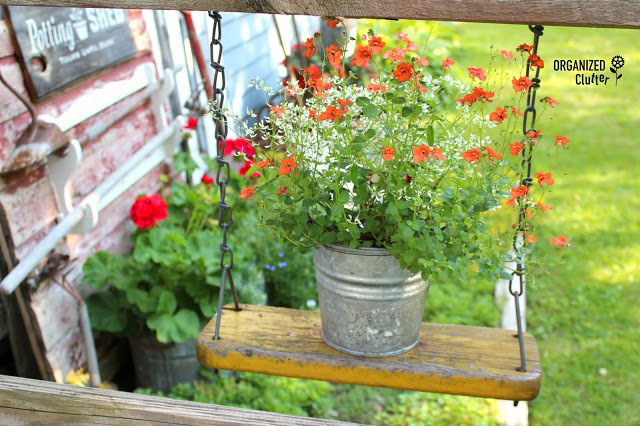 A mini-galvanized bucket of annuals on a swing. A nail in the center of the seat swing and a hole in the bottom of the bucket that slips over the nail, keep it from blowing off. Another mini-bucket with framed annuals. The tiny pink blossoms are annual baby's breath. 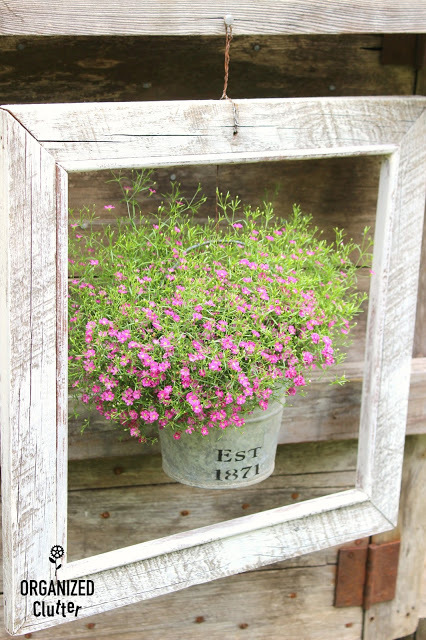 A weathered wood frame, mini-bucket and a techno heat lobelia. More framed lobelia variations with a painted frame and stenciled bucket. 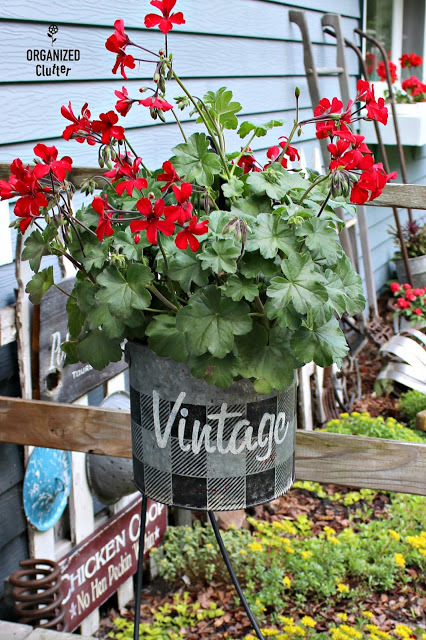 Here is an enamelware pail with a Martha Washington type geranium. 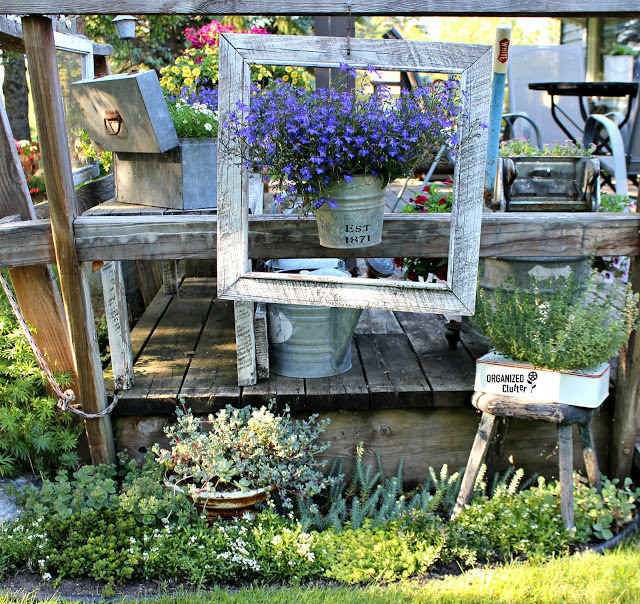 A rustic chair and sign complete a junk garden vignette. On my deck bench, a line of mop buckets with techno heat lobelia and red nemesia. An enamelware pail of fuchsias in the basket of an old bike parked under a tree. 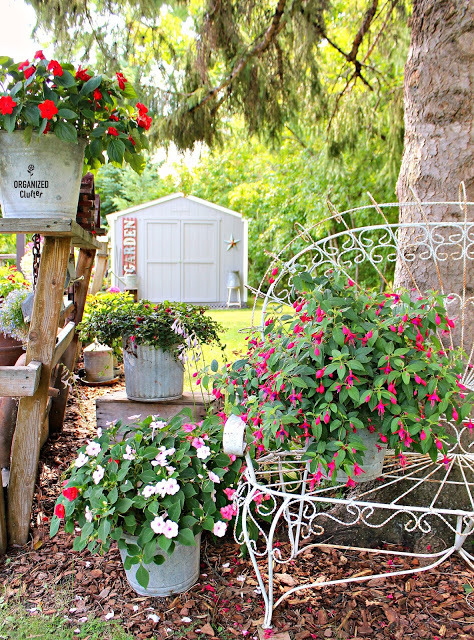 A galvanized bucket of impatiens mounted to an old wagon board, and an enamelware pail of Nicotiana on a pie cabinet. A wooden bucket with a plastic liner painted red and distressed for the 4th of July! Add a red, white and blue license plate, and patriotic colored plantings. 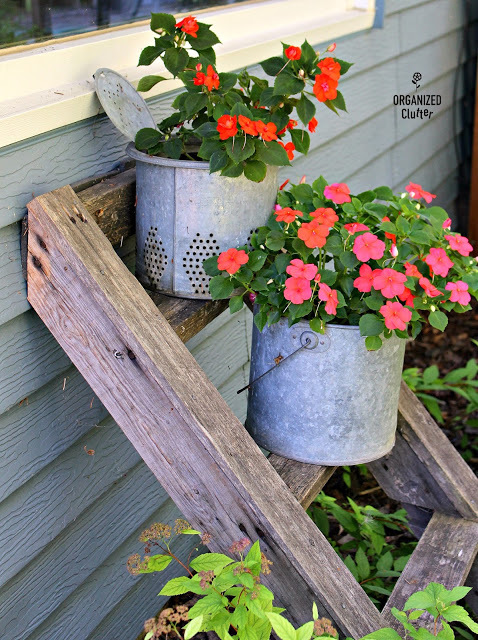 Impatiens in a minnow bucket AND a minnow bucket insert on the steps of a rustic ladder. The ladder was from an old tree house. Galvanized buckets of fuchsias and impatiens under a tree. 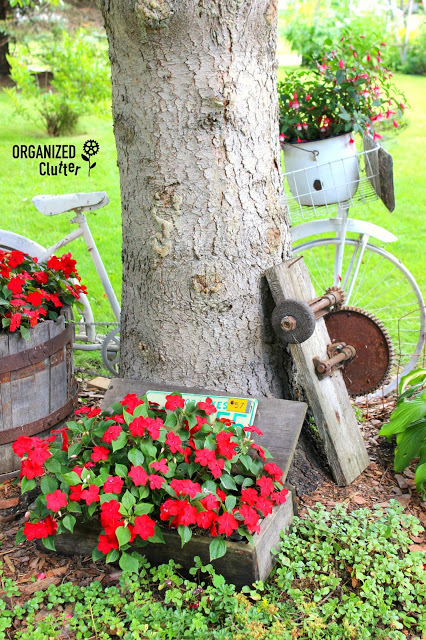 Buckets are great in the junk garden with or without flowers! These stacked buckets are just part of the decor! Buckets on an old bench with nemesia, techno heat lobelia, and black eyed Susan vines. Weathered wood and galvanized were made for each other. Layering of junk in my sister in law Kris's garden. Buckets in a wagon and also a wire gym basket. It's a "Custom" planting for sure. An old rusty black pail with fuchsias. Orange Lantana and Zinnias in a pail on an old stool in the flower border. More orange with a license plate. 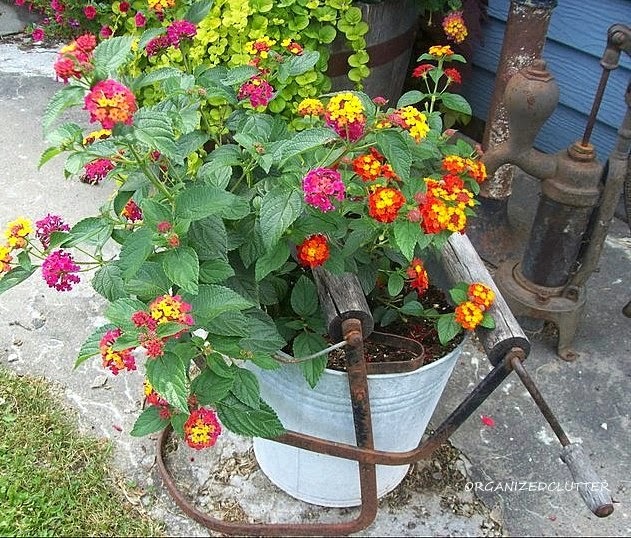 More colorful Lantana in a mop bucket! 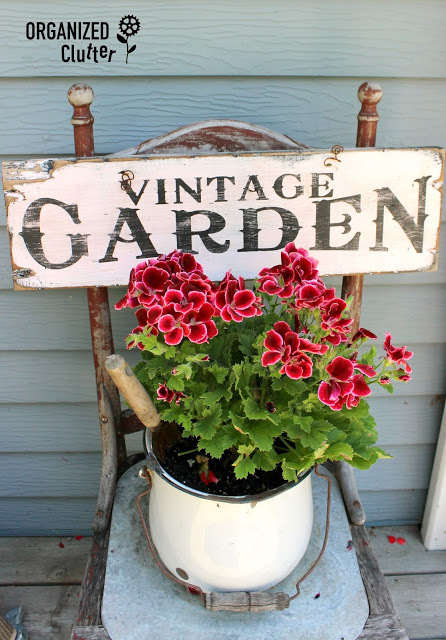 A red geranium in a vintage lard pail. Perfect for a patriotic display! A mini-bucket of impatiens hanging from an old rusty spring. Another enamelware planter on a bench at my friend Danita's house. 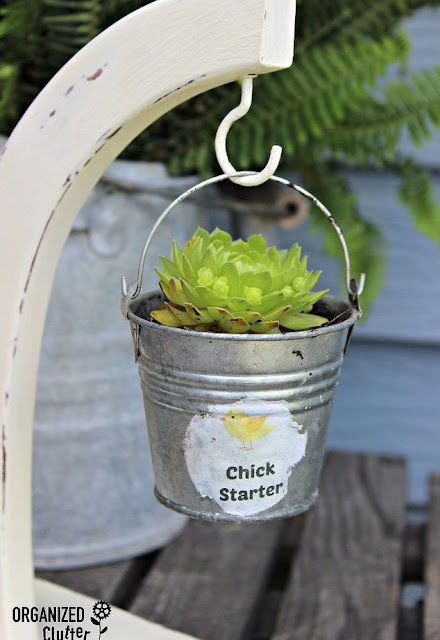 A super mini-bucket of hen and chicks hanging on a banana stand. You just can't have too many pails and buckets! Beautiful junk garden. The colors are so vibrant against the faded buckets. Positively gorgeous!!!! I adore your garden!